Mayor Bill de Blasio released major details concerning the new Citywide Ferry Service, whose new routes are coming online the summer of 2017 and 2018. Yesterday, New York City Mayor Bill de Blasio released major details concerning the new Citywide Ferry Service, whose new routes are coming online the summer of 2017 and 2018. The Brooklyn Navy Yard, already the hub of extensive development, will be the Service’s “homeport” and feature a 56,000-square-foot storage and maintenance facility with berths for 25 ferries. 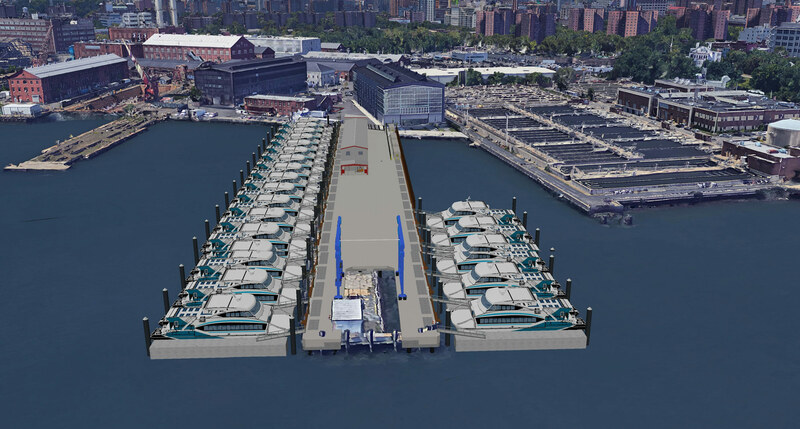 This is where ferries will be cleaned, restocked, repaired, and fueled, and will also serve as a new stop on the East River route that runs from E. 34th St. to Wall St./Pier 11. In a press release, the Mayor’s office added that the new facility will be elevated to comply with FEMA flood standards and fully operational by 2018. The Citywide Ferry Service is part of a broader plan from the Mayor’s Office to increase underserved New York City communities’ access to Manhattan and create an overall more robust and evenly-spread public transportation system. New routes will run from Manhattan to: Southview in the Bronx, Astoria and the Rockaway in Queens, and Bay Ridge and Red Hook in Brooklyn (just to name a few). The Mayor’s Office estimates that the Service’s 20 ferries, working across 21 landings and six routes, will make 4.6 million trips per year. Job seekers and transportation enthusiasts alike will also be excited to hear that the homeport brings with it 200 new openings for captains, deckhands, concessions operators, and other related roles. Applicants can inquire through the Brooklyn Navy Yard’s Employment Center or Workforce1 Career Centers. For more details on the Citywide Ferry Service, see their website here.